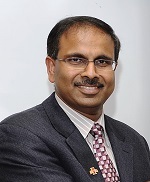 Dr. “Sri” S. Sritharan joined the Department of Civil, Construction and Environmental Engineering Department at Iowa state University as an Assistant Professor in December 1999. He became an Associate Professor in 2005 and Full Professor in 2010. In addition to his departmental role as the Director of graduate Education (DOGE), he currently serves as the Associate Department Chair and Wilson Engineering Professor. Dr. Sritharan earned his BSc degree in civil engineering from the University of Peradeniya, MS degree from the University of Auckland in New Zealand. Prior to pursuing his PhD at the University of California at San Diego (UCSD), he worked as a Scientist in the Engineering Seismology section of the Institute Geological and Nuclear Sciences (IGNS) in New Zealand for more than 4 years. His work at IGNS focused in the areas of microzonation, attenuation of ground motions and understanding the behavior of field structures subjected to earthquake loading. He received his PhD in Structural Engineering in 1998. Prior to joining Iowa State University, he served as an Assistant Project Scientist at UCSD and worked primarily on the PREcast Seismic Structural Systems (PRESSS) program. His research interests include Earthquake-resistant design and analysis of structures, precast/prestressed structural systems, soil-foundation structure interaction (SFSI), Ultra-high performance concrete (UHPC) and especial topics in Wind Engineering and Wind Energy Systems.